Overall Print Size: 27½" x 20;"
"The first [Royal Air Force] Eagle Squadron, No. 71, was formed in September 1940, at the height of the Battle of Britain. The squadron was composed of volunteer American pilots who fought for England against the German Luftwaffe. In September 1942, the three Eagle Squadrons were transferred to the US Army Air Forces as the 4th Fighter Group, with 71 Eagle Squadron becoming the 334th Fighter Squadron. The squadron achieved historical success throughout World War II, the Korean War, and Vietnam, before transitioning to the F-15E in 1991. Since 1994, the squadron's mission has been to develop and train the next generation F-15E Strike Eagle warriors. The squadron is currently stationed at Seymour Johnson AFB, NC..."
To the left of the text is a beautiful image of the "morale patch” worn by Squadron members each Friday. It is the emblem of the Royal Air Force 71 Eagle Squadron. To the right of the text is a beautiful image of the United States Air Force emblem of the 336th Fighter Squadron. This is the patch worn by Squadron members every day of the week except Friday. Each "FIRST FROM THE EYRIES" print has been individually signed and numbered by the extraordinary artist Ronald Wong. Mr. Wong is well known for his beautiful and historically accurate depictions of modern US Air Force and Royal Air Force squadrons and wings. 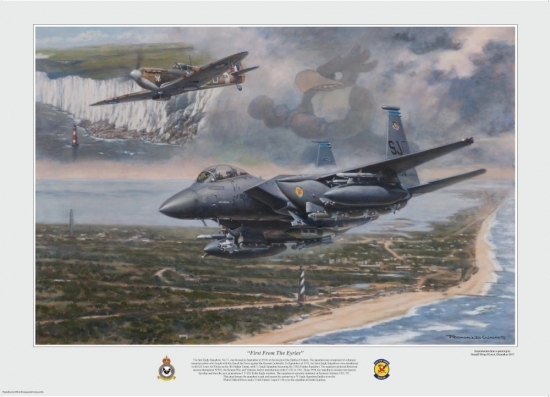 This is Ronald Wong’s fourth print for a squadron from the famous 4th Fighter Wing.